Over the last 15 years, the focus of chemical pollution has shifted from conventional pollutants to so-called “emerging” or “new” unregulated contaminants. These include pharmaceuticals and personal care products, hormones, UV filters, perfluorinated compounds, poylybrominated flame retardants (BFRs), pesticides, plasticizers, artificial sweeteners, illicit drugs, and endocrine disruptor compounds (EDCs). Despite the increasing number of published studies covering emerging contaminants, we know almost nothing about the effects of their transformation products and/or metabolites. 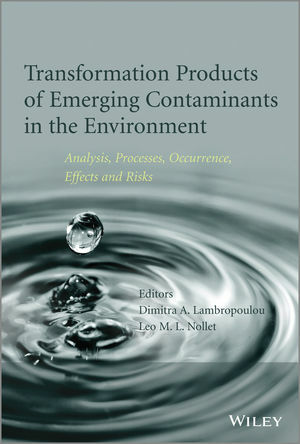 Transformation Products of Emerging Contaminants in the Environment is a valuable resource for researchers and industry professionals in environmental chemistry, analytical chemistry, ecotoxicology, environmental sciences, and hydrology, as well as environmental consultants and regulatory bodies.